There is an aspect of coal mining that gets relatively little attention, even though it is growing in popularity, It is with this method that I will conclude this series on mining, and its precursor on oilwell production. Most mining can be divided clearly into either surface mining, where the rock over the coal is removed, and the coal taken away before the land is restored, or underground mining, where some of the coal has to be left in place to hold the roof up. But what happens in the middle? There is an intermediate between the two main methods of mining, when the surface mine has produced coal from a seam that is steadily getting deeper, it reaches a point where stripping the rock from above it is no longer economical. So what to do? And the answer is what is known as Highwall Mining. 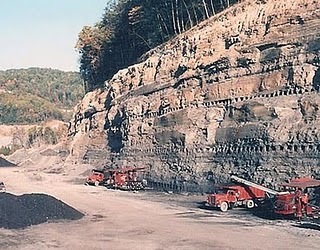 When the last economic cut has been made with a surface mining operation, the coal seam is still exposed, lying under the rock and overburden in what is known as the Highwall of the mine. So, before the land is reclaimed and that final cut along the face filled back in, sometimes it is economic to look at using different mining machines to mine into that exposed coal face in the Highwall – hence the name. Coal seams that might be mined this way are not going to be worked to that great a distance into the coal that a full underground operation will develop, rather a machine is mounted at the surface face of the coal, and advances into the coal mining and feeding it back out, so that it can be collected and hauled away. 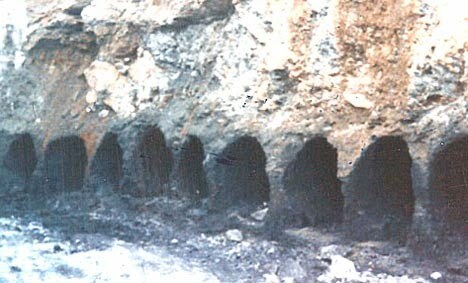 The early machines that were used for this were often Augers, and in this picture the highwall had three seams of coal in it, (at the current bottom of the wall, and along the two sets of higher augered holes). 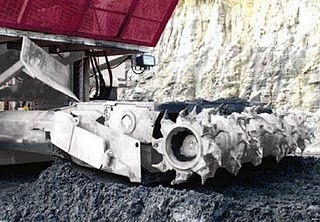 The friction generated as the scroll rubs against the walls of the hole drilled require that it be pushed with increasing force, as the auger head mines deeper into the seam. This ultimately limits production from a single hole, since there is only a certain amount of force that can be applied through the auger string before it starts to deviate from drilling straight and, as a result, the head may begin to penetrate either the floor or roof rock around the coal, which is not to be desired. Back when I did some analysis of these some decades ago that limit was less than a couple of hundred yards. However as the top picture shows, the holes can be placed fairly close together, though again care has to be maintained that the auger doesn’t punch through into a previous hole, since it is the hole walls that help get the coal back out. The holes, once augered, can be backfilled with mine waste if that is thought viable. This is a much more sophisticated machine and replaces the simple auger scroll with a miniature version of a continuous miner, which I have previously described being used underground. 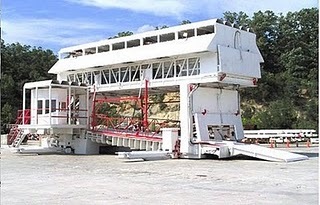 The resulting support machinery is significantly larger, although the basic functions, mining the coal, and feeding it back out to a cross-conveyor that then loads into trucks, remains the same. 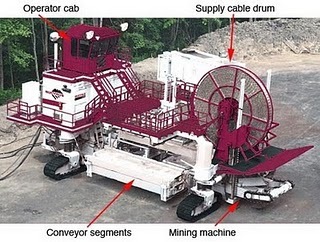 The mining head can oscillate up and down as it moves forward into the coal, thus mining seams that are larger in size than the machine itself (something that the auger does not do as well). 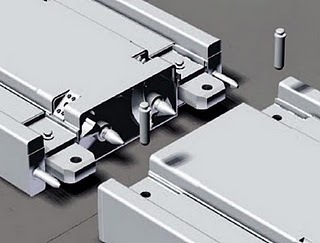 The box conveyor sections provide a more robust platform for pushing the head forward into the coal, and contain two screw conveyor segments that carry the coal itself back to the cross conveyor. A machine of this type can produce between 40,000 and 120,000 tons of coal a month, depending on the conditions in which it is operating. It needs a crew of 3 or 4 folk, and averages 30 – 40 tons per man-hour. Remember that it must reposition at intervals. Highwall miners of this type can advance much further into the highwall than augers, and machines are available that can mine in as far as 1,600 ft, achieving production levels (in Appalachia) of 300,000 tons a month. There is a video of the Addcarsystem, which is slightly different from the two described above, here). 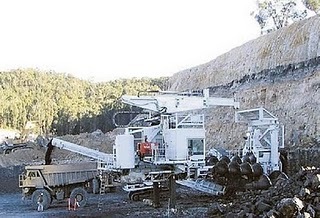 The Addcar system, which uses an open conveyor concept to bring the coal out. As I mentioned in an earlier post, this is the last segment of the coal mining series that I have been posting on Sundays. After a short break for Thanksgiving, I hope to begin a new series of Tech Talks, but more focused on nations from which we get our fuel, rather than on just the wells and mines that it comes from. Thanks, Dave for running this series. I look forward to your new series on the nations from which we get our fuel. I think hearing about the countries that give us oil could be quite interesting. Thanks very much for the coal mining series. It has been very helpful to me. Yes thanks, I'm mostly a lurker here at the oildrum, but I felt I should say thank-you on behalf of all the lurkers out here who really enjoyed these accessible and educational articles. Thank You for an informative series. It was well worth the read. I hope I did not miss any. 1) It messed up the seam for later punch deep mining when coal prices increased. 2) It was somewhat dangerous as the highwall could collapse (see photos) and cover up the machine and workers.